A winning combination of how-to guide and reference work, The Only Business Writing Book You'll Ever Need addresses a wide-ranging spectrum of business communication with its straightforward seven-step method. These easy-to-follow steps save you time from start to finish, and helpful checklists will boost your confidence as they keep you on track. You'll learn to promote yourself and your ideas clearly and concisely--whether putting together a persuasive project proposal or dealing with daily email. 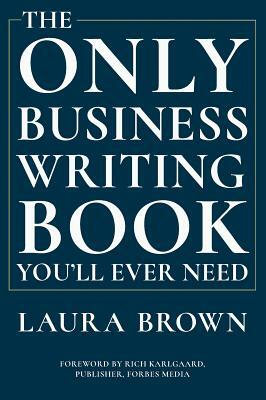 Laura Brown's supportive, no-nonsense approach to business writing is thoughtfully adapted to the increasingly digital corporate landscape. She provides practical tips and comprehensive examples for all the most popular forms of communication, including slide presentations, r sum's, cover letters, web copy, and a thorough guide to the art of crafting e-mails and instant messages. Insightful sidebars from experts in various fields demystify the skills of self-editing, creating content, and overcoming writer's block, and Brown's reference-ready resources on style, punctuation, and grammar will keep your writing error-free. Nuanced, personable, and of-the-moment, The Only Business Writing Book You'll Ever Need offers essential tools for success in the rapidly changing world of business communication.